While Limpd is not the biggest fan of the classic Islay whiskies (the intensely smoky ones), he has found his way to Islay on numerous occasions thanks to the Bruichladdich and Bunnahabhain distilleries. I’m pretty sure that at one point he had a bottle of the Bunnahabhain 12 in the rotation, but I can’t say that I spent all that much time with it. I know that I definitely liked it, so when it came time to pick up a new whisky, I decided to pick up a bottle of my very own. Bunnahabhain 12 year old Islay Single Malt Scotch Whisky has been re-introduced as an un-chillfiltered spirit, a move which has excited whisky lovers and experts from across the world. With the move to un-chillfiltered, the packaging has been revised to complement the new expression. Smoked oak glass has replaced the traditional emerald green of the 12 year old bottle, with dual labelling conveying an overall sense of speciality, subtlety, confidence and luxury, reinforcing the premium quality and heritage of the brand. A revised neck label has been developed displaying the product’s age. Appearance: The color of 100% Maple Syrup, i.e. dark amber. Aroma: Very rich smelling with oodles of sea spray, brown sugar, allspice, caramel, and, cinnamon. And there’s one more thing. This past week at work, someone has been toasting up some blueberry bread as a snack, and since my office sits about 12 feet from the toaster oven, I’ve had to smell it all week long (you’d think they would have offered me a slice!). That being said, there is a definite fruitiness coming through on this whisky, and since I can’t get this blueberry smell out of my head, I’m going to say that there is a hint of fresh baked blueberry bread in there too. Taste: Medium mouthfeel with just a bit of an oily texture. All of that sweetness in the nose is right there in the beginning with lots of brown sugar and vanilla. The baking spices kick in at mid-palate with prominent cinnamon, clove, and ginger spiced heat. It all comes together at the finish which is when you really get the Sherry influence on this whisky via lots of dried fruit and spice along with a slightly bitter aftertaste. I first opened up this bottle of the Bunnahabhain 12 back in mid-January. While there are some whiskies that take a bit of time to get used to, this is definitely not one of them. I enjoyed this whisky immediately thanks to its smooth, rich flavors and high drinkability (in moderation of course!). Although I don’t usually make repeat purchases, there are a few whiskies out there that I would (a) buy on more than one occasion, and (b) recommend to others or give to someone as a gift. 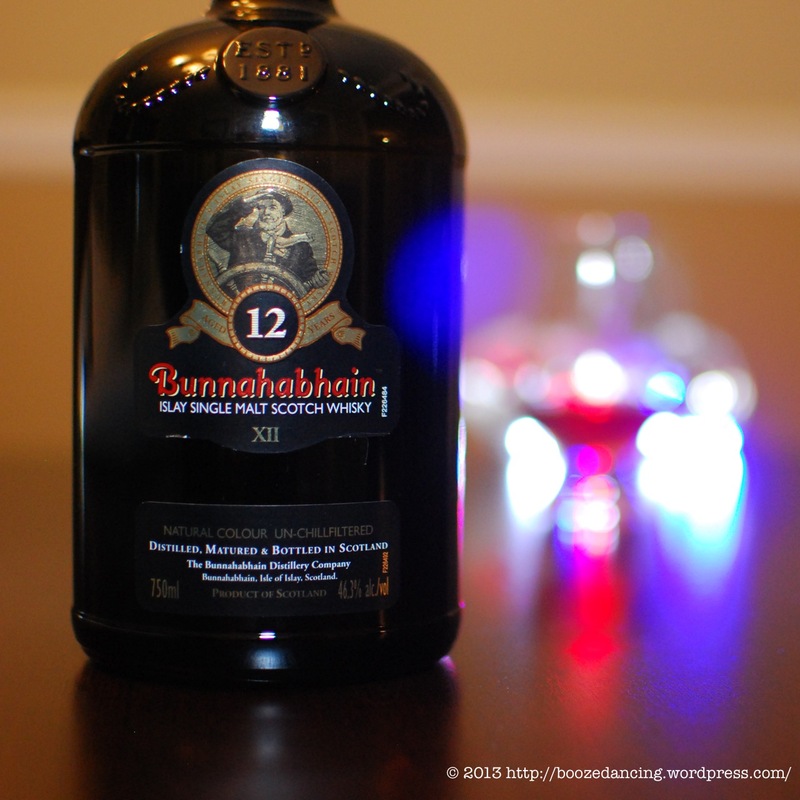 The Bunnahabhain 12 is one of those whiskies. Great stuff and highly recommended. For a brief history of the Bunnahabhain distillery and yet another review of their 12 YO expression, check out the Chemistry of the Cocktail blog. Agree 100%. Bunnahabhain is my go-to Islay for recommending/gifting to other people because it’s such a crowd-pleaser, no matter what the drinker’s stance on peat monsters may be. BTW, the 18 yo is even better—I shall have to send you a sample as soon as I buy some teeny bottles. Good review. I really liked this whisky. We had a bottle that kicked at the Bunnahabhain-apalooza (D-500 party) where we had the 12, the Toiteach, and the Scott’s Selection 1988 Bunnahabhains. I think that on it’s own the 12 is a very nice whisky, although I feel it had a hard time keeping up with the other two side-by-side. I’m sure I’ll end up buying another bottle sometime in the future, it was worth the price. If you have any of the 12 left let me know and I’ll bring the other 2/3s of a Bunnahabhain-apalooza ™ over! Yo Max! I saw the Toiteach on the shelf when I picked this up. Almost went for it, but didn’t know much about it, so I went with the tried and true. As far as a wee exchange goes, that sounds great! I have around a half a bottle left. Let’s check our schedules and get something on the slate. And FYI, Limpd has talked about setting up a long overdue mini WhiskyFest. Consider yourself invited once we get our acts together. Interesting. In the days before I was called to the service of craft beer, I was a fan of Sherry Wood Finished Glenmorangie. After a while, though, I found the sweetness a bit off-putting and was captured by the Peat Monsters (not necessarily the Compass Box blend, however). Ah yes! The Glenmorangie Sherry Wood is a lovely whisky (now goes by Lasanta I believe), but I like the Bunnahabhain much better due to the maritime elements that come through. Me thinks you would enjoy it! Grazie per i complimenti! Auguri! That reminds me not to forget the Unagi rolls on the way home tonight.